Before I started teaching my students a unit about the Holocaust this year, I thought a lot about how I could get them to think, process, and reflect meaningfully and critically about this history, and also inspire them to act in a manner that influences the world for good. This particular group of students did not need to write another essay citing textual evidence from multiple sources; they were quite good at that already. Plus, writing the typical "end of unit essay" did not address my goals for the unit, which were to have students engage with the material they learned, demonstrate mastery of the unit’s anchor texts, and make a significant contribution to the larger community. After much thinking and encountering the Art in the Face of Death activity on the USC Shoah Foundation's IWitness website, I decided on a culminating activity that tasked students to produce art pieces that we would share with the community. IWitness is a wonderful resource; it's filled with searchable testimonies and activities that can easily be incorporated into a Holocaust unit. The Art in the Face of Death activity features survivors sharing artwork and poetry they created in response to their experiences during the Holocaust. 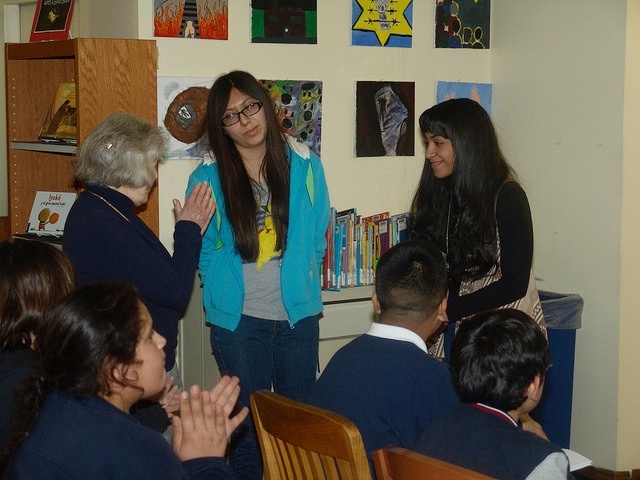 The activity helps students see how art can be a powerful tool for processing difficult events. If survivors could confront such complex experiences through art, my students could use art to think through our study of the Holocaust as well. 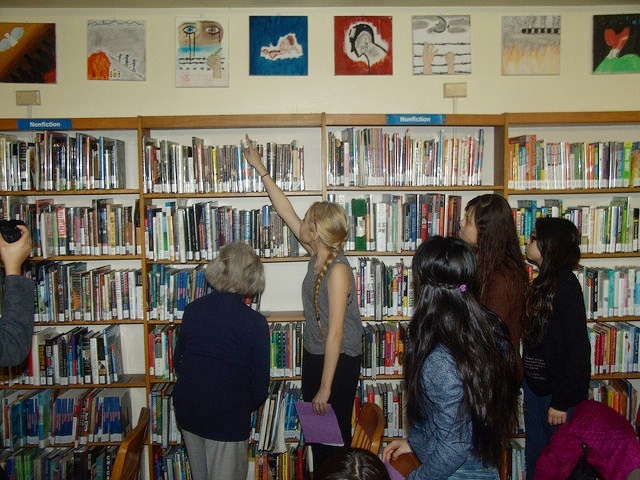 Brandon Barr's Facing History students share the artwork they created as part of their study of the Holocaust. All photos from Brandon Barr. In order to get my students thinking in more abstract and artistic ways, and to help me think about how to engage more of the school community with this project, I spoke with my school's art teacher, Christina, who traded spots with me for a day to lead a session for my class on conceptual art and technique. Neither of us wanted students to recreate scenes from what was read. We wanted them to think in metaphor and use powerful sections from the texts we studied as inspiration for their art. Christina explained to the class how art could capture, channel, and convey emotion through symbols and figurative representations. Her advice was extremely helpful. Next I reached out to local Holocaust survivor, artist, and author Ava Kadishson Schieber. I borrowed all of the copies of her book, Soundless Roar: Stories, Poems, and Drawings, that Facing History had in its Chicago office, so my students could read about her experience pretending to be deaf and dumb in an effort to hide on a farm for the duration of the Holocaust. We learned how her father was killed at Auschwitz, and how that loss has influenced some of her art. For Ava, art has been a way to cope with the grief of losing members of her family and move forward after the Holocaust. Ava's resilience was inspirational for my students, and her art served as a mentor text for making their own art pieces. Students discuss a passage of the book "Soundless Roar" with its author, Holocaust survivor Ava Kadishson Schieber. Class each day revolved around listening to survivor testimony, closely reading a chunk of text from one of our anchor texts, Soundless Roar and Night by Elie Wiesel, and discussing our inferences. Once we had almost finished our unit, students began working on their own art projects on canvas, supported in part through a grant from the Chicago Foundation for Education. Once artwork was completed, I scheduled an evening at our local library branch for Ava to meet my students with their art prominently displayed. This night addressed one of my initial goals for the unit: reaching the larger community. Parents and community members joined my class, Ava spoke about her art, and students shared their own art individually with her. Ava spoke about how producing art keeps her young and helps her process her thoughts. Students shared how they used art to process their own thinking about the Holocaust, and talked about the challenges of depicting their thoughts symbolically and thinking beyond the graphic images in the texts we studied. Their respect and reverence for Ava was evident, as was their pride in their work. The art that my students produced and discussed that evening was incredible. Not only did they get up and share in front of the large audience, but they also talked shop with Ava. They had never had a conversation with a professional artist as they did with Ava that night. This type of sharing heightened their voice as individuals. When the students presented Ava with a portrait they created for her, she was clearly touched, and said how moved she was that her work had inspired so much good art. 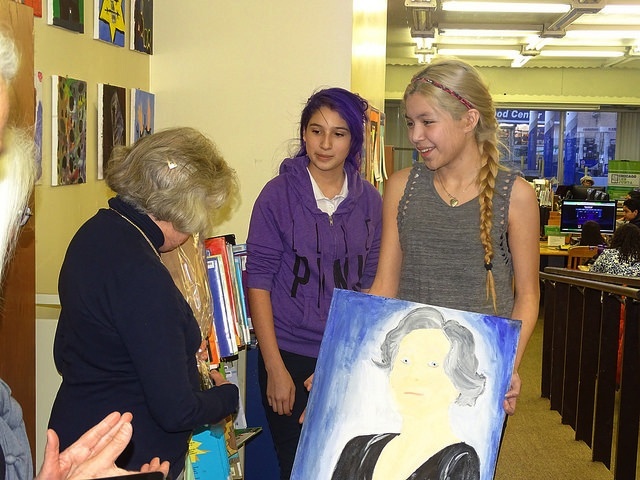 Students shared a portrait that they created for Ava to express gratitude for her visit. Art has an important place in Holocaust instruction. It enabled my students to read, view, discuss, listen to, and engage with multiple text types and individuals to make their art projects possible. Most importantly, they were compelled to make choices and deliver artwork that reflected a profound understanding of the many facets of this complicated history. The partnership between Facing History and Ourselves and the USC Shoah Foundation brings together extensive scholarship and experience in Holocaust education, strong digital infrastructures, and complementary resources. Find another idea for using art in the history classroom with this free Facing History lesson plan. How do you use art in your classroom? Comment below! 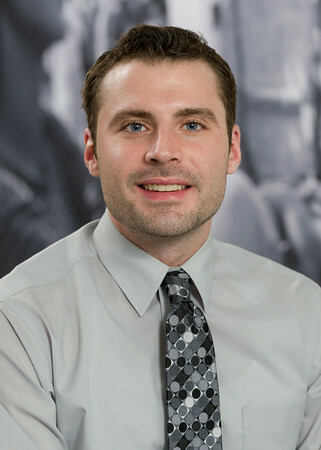 Brandon Barr has been a Language Arts teacher at Nightingale Elementary School in Chicago for nine years. He uses several Facing History units as part of his teaching each year. This January, he participated in the "Past is Present" commemoration that marked the 70th anniversary of liberation of Auschwitz in Poland as a Regional Consultant for IWitness.